Governor, 1929-33; Under Secretary of U.S. Treasury; appointed Ambassador to Great Britain, 1946. Birthplace stands here, grave 300 yds. 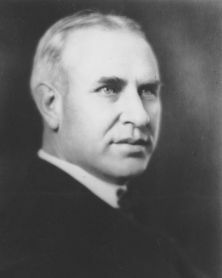 N.
Oliver Max Gardner, whose political organization dominated state politics for a generation, took office only months before the stock market crash of 1929 and responded to the economic crisis with retrenchment and centralization of governmental functions. Like his brother-in-law Clyde R. Hoey part of the “Shelby Dynasty” (a term Gardner disliked), the future governor was born on March 22, 1882 in the Cleveland County town. His father, Oliver Perry Gardner, was a physician, legislator, and Confederate veteran. His mother, the former Margaret Young, died when Max, the youngest of twelve, was ten years old so he was raised by his sisters. 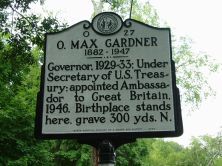 In 1900 Max Gardner enrolled at the North Carolina College of Agriculture and Mechanic Arts (present North Carolina State University) and in 1906 he studied law at the University of North Carolina. At both schools he captained the football team. In 1907, the year he returned home to practice law, he married Fay Lamar Webb, daughter of Judge James L. Webb and niece of Congressman E. Yates Webb. O. Max and Fay Gardner had four children. In 1910 Gardner was elected to the state senate and four years later was returned for a second term, during which he served as president pro tem. In 1916, the year Thomas W. Bickett was elected governor, Gardner was elected lieutenant governor. In 1920 Gardner entered the race to be Bickett’s successor. In the first primary Robert N. Page was eliminated but in the second Cameron Morrison, with the backing of the political machine of Senator Furnifold Simmons, defeated Gardner. The Shelby attorney returned to his law practice and to his farm. With partner O. M. Mull he founded Cleveland Cloth Mill. Gardner remained active in party politics and in 1928 was unopposed for the Democratic nomination. He defeated Republican Herbert F. Seawell handily in the fall. For eight years, under the administrations of Cameron Morrison and Angus W. McLean, the state had witnessed relative prosperity. The onset of the Depression presented Governor Gardner with unforeseen challenges. In 1930 he authorized a study of state government by the Brookings Institution which recommended a massive shift of power from county courthouses to Raleigh with the state taking responsibility for all secondary road maintenance and public school costs. Other reforms included reduction of property taxes, limits on local bond issues, and creation of a central purchasing agency. With the governor’s support, the legislature approved workmen’s compensation, the secret ballot, and abolition of the chain gang system. Gardner counted as his proudest achievement consolidation of the University of North Carolina in Chapel Hill, the College of Agriculture and Engineering in Raleigh, and the North Carolina College for Women in Greensboro (present-day University of North Carolina at Greensboro). In each of these efforts his moves were opposed by special interests and required all the governor’s leadership abilities. Gardner promoted his “Live-at-Home” program to encourage the planting of crops for subsistence. While deriving favorable attention, the program failed to stimulate the state’s economy. 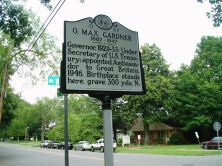 During Gardner’s term labor strikes took place in Gastonia and Marion leading him to call out the National Guard. By 1933 Gardner had in place a political organization to rival that of Senator Simmons, who had been defeated in 1930. The next four governors came to office with Gardner’s backing. In 1933 Gardner moved his law practice to Washington, D.C. Gardner financially supported Boiling Springs Junior College which in 1942 changed its name to Gardner-Webb in his honor. During World War II Gardner served on the board of the Office of War Mobilization and Reconversion and in 1946 he was appointed Under-secretary of the Treasury by President Truman. The following year he was named Ambassador to Great Britain but died on February 6, 1947, only hours before he was to sail for London. A Baptist, he is buried in Shelby’s Sunset Cemetery. William S. Powell, ed., Dictionary of North Carolina Biography, II, 274-276—sketch by Richard L. Watson Jr.